Scoot Boot sizes do not correspond to other brands of boots or traditional steel shoe sizes. In order to accurately size your horse, you must carefully measure according to the instructions provided on our Measuring for Scoot Boots page. We recommend measuring in mm or converting measurements taken in inches to mm before referencing the sizing chart. The sizing chart is designed to be referenced right after a fresh trim (no more than 2 weeks out) but it is calibrated to account for growth between trims. The measurements ranges in the sizing chart are designed to reflect the size of a hoof with a correct barefoot trim, meaning the hoof has a rolled toe with a strong bevel to the wall and no extra length in the toe or heel (sizing will be distorted for hooves not successfully maintained with a natural trim). 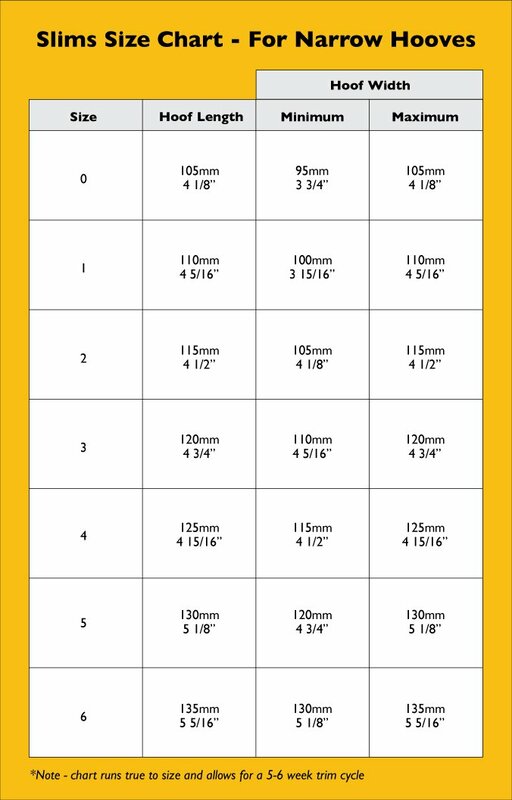 Sizes increase in 5mm (3/16”) increments. Perfectly round hooves will work in both Regular and Slim sizes with the Slims serving as a half size between the Regulars. 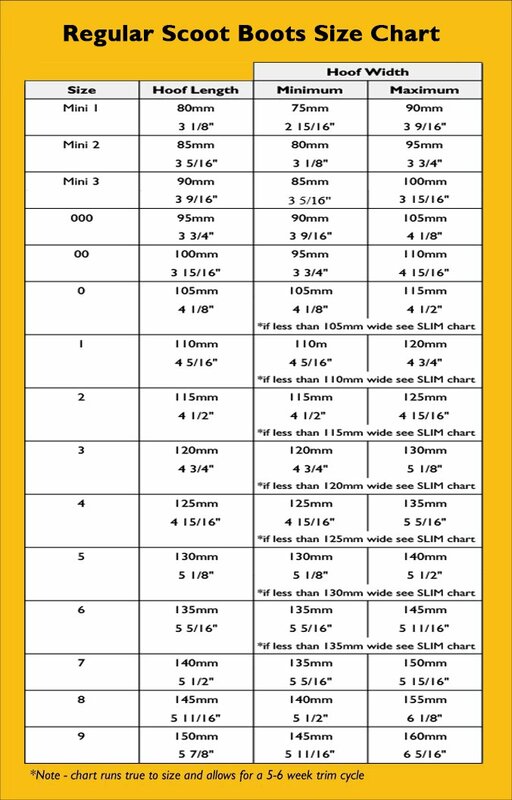 If you need Scoot Boots for both front and back hooves or two horses with similar measurements, we recommend starting with one pair and using it as a reference point to determine the other size that you need (see our Evaluating Scoot Boot Fit page). What if my horse's measurements don't fit nicely in one of the size ranges? General rounding rule: select the smaller boot size if you are between the size measurements. For example if your hoof length measurement is between 121mm (4 13/16”) and 124mm (4 15/16") long, select the hoof measurement of 120mm (4 3/4”) on the chart meaning you would need size 3. If your horse doesn't fit nicely within one of the sizing ranges, we highly recommend using a sizing kit - we find Scoot Boots work well on many hoof shapes, but often you'll need to try a few sizing shells to see exactly which size will work best. For hooves that are different sizes: If your horse's two hooves have slightly different measurements (i.e. one hoof is in between sizes), select the boot size that matches the largest hoof. However, if one hoof is a full size smaller, you can purchase Scoot Boots in singles to do a mix-matched set (just let us know if you don't see the size you need in-stock for the singles and we'll move some for over you). For WIDE hooves: If your horse’s hooves are 10mm (3/8") wider than long you need to select the size from the ‘maximum’ width measurement and not length measurement (for example, if your hoof length is 110mm (4/18") and width is 120mm (4 3/4"), you select size 2). However, if your horse's hooves are wider than long you may have excess flare that should be addressed by appropriate barefoot trimming practices. Excess flare may cause the sizing to be off as the measurements of the bottom of the hoof will not reflect the overall volume of the hoof, so we recommend using a sizing kit to determine the best size. If the hoof width exceeds the hoof length by more than 10mm (3/8"), then Scoot Boots may not be suitable for your horse. We've had good success fitting Scoot Boots to these extra wide hooves, but the sizing shells are necessary to determine which size will work best. For NARROW hooves: If the hoof length exceeds the hoof width by more than 10mm (3/8") then Scoot Boots may not be suitable for your horse and you would need to using sizing shells to determine if they will work for your horse.